There is also a lot to admire about the urban environment that helps to build an excellent place to live in that many people even choose to move to from overseas. 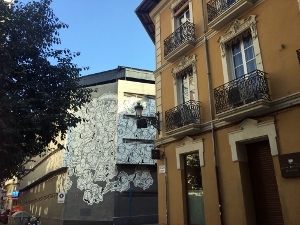 Usually Spanish cities have an old town and some splendid architecture where many buildings are hundreds of years old or more and it is common to see exuberant ironwork balconies and classical bandstands and fountains that give the area such style add character. 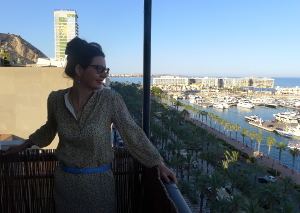 This modern ninth floor apartment was designed around a patio to maximise the view over the Explanda and the marina. This outdoors area allows for the most shade possible throughout the day taking into consideration its aspect in relation to the sun. 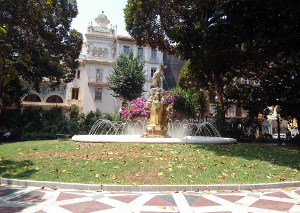 The Explanada is a beautiful tree lined marble tiled promanade along to the seafront in Alicante about 500 meters long and it is famous for its bold waves pattern. Most buildings are painted in rich earthy colours that echo the rich landscape and the relatively strong light that this part of the world enjoys most of the year. It is no coincidence that Spain is known for its ceramics and tiles (see our Create Display blog from last Spring on the Ceramics museum in Valencia). 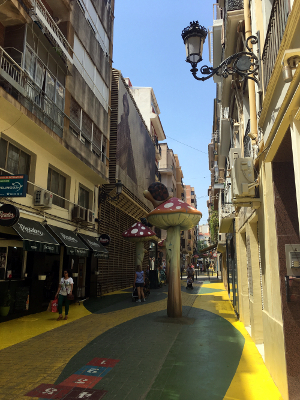 This photograph show the Calle San Francisco street which has fibre glass mushrooms that children and the young at heart enjoy playing with. Using scale to entertain is simple and effective and there are some nice tapas bars and shoe shops along here this street too. The leather products in Spain are also very well crafted and also good value. 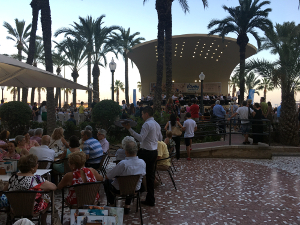 The Spanish love to dress up and socialise in the cool evenings and there are many family friendly restaurants catering for all ages until late into the night which makes for a special and positive atmosphere down town. 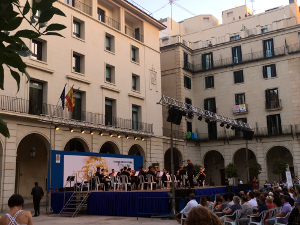 This year in Alicante we were lucky to catch the annual Brass music festival which celebrated the best brass musicians internationally. 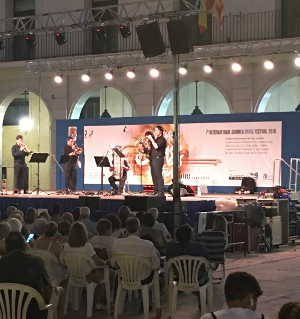 In its seventh year the events programme featured many very fine jazz performances. The superb quality tunes blended perfectly with all busy visitors dressed up for a night out. Sitting at elegant bistro bars locals and holidaymakers unwind with their tapas and glasses of the local wine in the splendour of the 16th century town hall square. This outdoor stage with a permanent canopy is designed to acoustically through the musicians sound forward to the audience while lighting up the performance effectively. Mediterranean style permeates every smart home or great restaurant in this sophisticated but laid back city. Our favourite meal of our recent trip was at La Mary. A reasonably priced formal dining restaurant situated on a side street in the main town La Mary serves exceptionally delicious food and wine with excellent service. 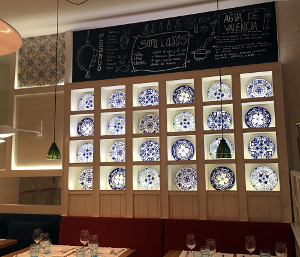 We also enjoyed the recently refurbished classically modern interior design with two display box wall cabinets each showing twenty four beautiful blue and white traditional plates, which were all subtly backlit, adding to the fresh and intimate ambience. 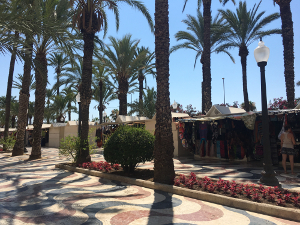 In thriving cities such as Alicante unexpected visual juxtapositions are a speciality. In Calle Canalejas the ornate building houses the four star Restobar Gema Penalva that serves authentic local food. Next to that a large new multi storey car park boasts a striking mural of a big crowd of people painted in linear black and white who are seemingly staring up at the viewer as they were all having their photograph taken from above. It is well executed and as likeable as it is surprising. 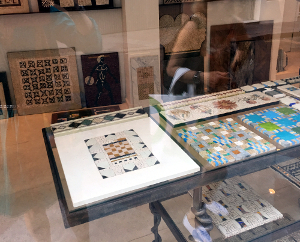 Opposite a mosaic tile shop sells intricate high end specialist ceramic wares that are organised as individual miniature artworks like a gallery whose pieces would add the finishing touch to any upmarket interior. 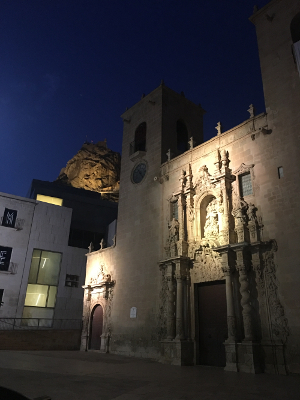 The Basilica of Santa Maria in built in the Gothic 16th century style and sits next to the Museum of Contemporary Art in Alicante that reopened in 2011 after a major renovation. With care, thought and ample resources, the lives of residents in a city can be improved and enhanced by well maintained and designed exterior spaces. Old and new buildings can successfully all sit together like a rich mosaic, that creates an environment that is as harmonious as possible, for the benefit of everyone.